The silk screen printed chihuahua is lightly padded and is attached to the inside of the pocket with a ribbon - it can be played with or tucked away in the pocket. 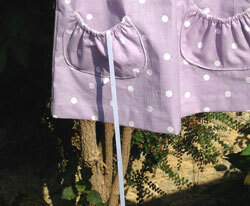 The pockets are positioned low, so that when the child grows, the dress can still be worn as a tunic. 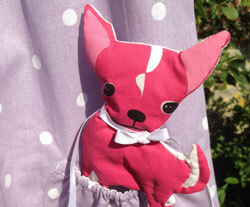 This version of the chihuahua and spots dress usually works best for the younger age range. For the more active older children, the other chihuahua & spots dress where the chihuahua is stitched to the dress and peeking out of the pocket is recommended.